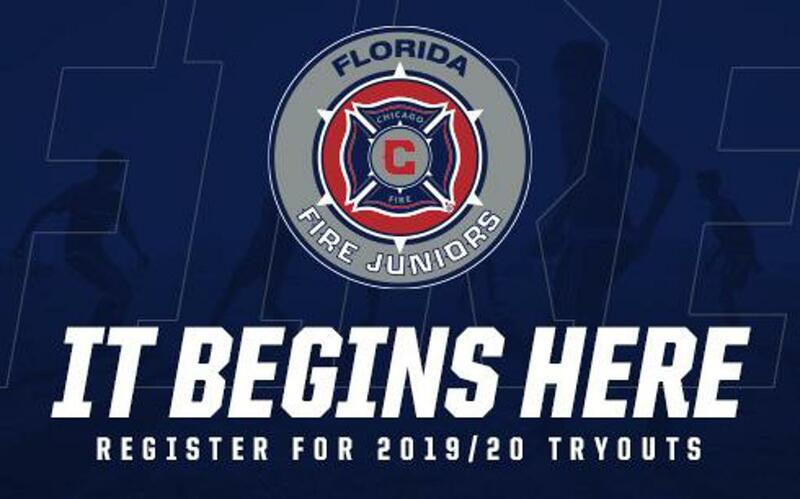 Register Today For Florida Fire Juniors 2019-2020 Tryouts! Tryouts Are Open To All Boys And Girls Born Years 2011 to 2001. Participants Receive A Free Florida Fire T-Shirt While Supplies Last. Each player needs to register for the US CLUB Tryouts through Gotsoccer. Make sure your child wear soccer attire on the day of tryouts. A ball/size 5, shin guards, water bottle and cleats. When you arrive check your child in at the check-in table. It is an absolute must that your child initially attends the session for the birth year he/she was born in – No Exceptions!!! See below for more information. Your child will receive a number to wear on their Jersey or a free numbered T- shirt. Please make sure they wear either to the other tryouts attend. Our check-in administrator or field marshals can assist you with which field your child will be on. Please utilize the designated seating areas set out for parents to view your child’s Tryout. Q: What do I have to bring to tryouts? A: Please make sure to bring. Dark Shirt, dark shorts and socks. A ball size 5, Shin guards. Water. Q: There are 2 Tryout dates posted - do we have to attend all of them? A: Preferably yes, as we do anticipate large numbers. Therefore we do encourage families to attend as many as possible to allow players to showcase their talent. Q: What if my child can only attend one Tryout due to being out of town or injury etc.? A: Please email Paul Williams at Doc@floridafirejuniors.com as well as the respective coach with that information. Q: What if my child wants to play up an age group? A: Please email your request to Paul Williams at Doc@floridafirejuniors.com as well as the respective coach with that information prior to the Tryouts. Once permission is granted it is an absolute must that your child initially attends the session for the birth year he/she was born in. Q: What if I have a question during the Tryouts? A: Please ask the administrators at the check in tables. Q: How do I know whether my child made a team or not? A: Every player will receive a call/email from the Head Coach of the team within 48 hours after the final tryout for their age group. A: To secure placement on a team, players must register then select a payment plan and pay the deposit within 48 hours. Then upload a current photo of your player to their gotsoccer account. Q: How many players will you pick for my child’s team? A: That will depend on your child’s age group and whether we will have one or two teams. 11v11 teams have up to 18 spots available. A: Official Practice Start will be August 13th. Q: Where and when will my child’s team practice? practice are at North Collier Regional Park, Veterans Park, Corkscrew Middle School and Golden Gate Community Park. Q: What league and Tournaments will my child’s team compete in? A: US Club Soccer League play will be determined by the technical staff shortly after the rosters have been finalized. Typical leagues are NPL, FPL, RED and the Florida Cup. A: Yes, please contact our Registrar Liz Wilroy @ registrar@floridafirejuniors.com to set up a payment plan.